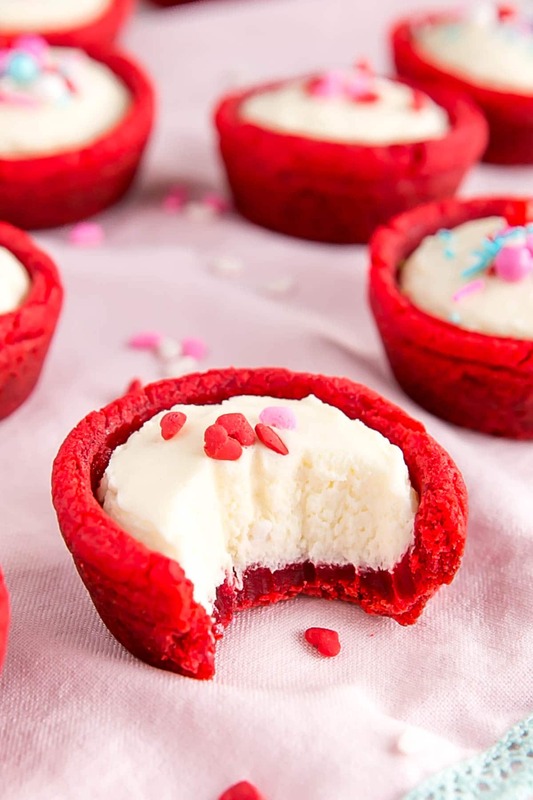 These Red Velvet Cookie Cups are a fun and easy treat to make for the one you love! 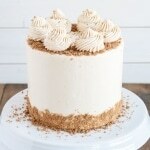 Cinnamon spiced cookies with a fluffy cheesecake filling. Sometimes I do crazy, impulsive things… like spending $25 on one jar of sprinkles. Seriously!! I get this vision in my head of what I want something to look like, and I obsess over it until I can make it happen. In this case, the vision involved very specific turquoise and red sprinkles that I needed for these Red Velvet Cookie Cups. I knew I could order them online (which is what I eventually ended up doing), but I swear I had seen them at Homesense for like $7. This was months ago, mind you, and I didn’t buy them at the time because I almost never do red or Valentine’s themed desserts. For some reason this year though, I’m all over it. At that time, I instead bought 4 other packs of sprinkles I have yet to use. 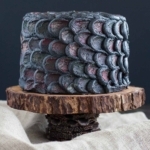 Before sucking it up and ordering online, I checked multiple Homesense locations in hopes that I might stumble up them. I don’t know what I was thinking, really. It had been months since I saw them there, but I thought I was miraculously going to find one jar of the exact color I would need. My efforts were fruitless, but I was stubborn and determined, so I shelled out the $16 Canadian, plus tax and shipping, which ended up being almost $25. For one pack of sprinkles that I’ll probably use one time. In hindsight, I should have bought the smallest jar instead of the 8oz one. Oh well! I don’t regret my decision, I just wish I had gotten them when I saw them at Homesense. You can bet I’ll be checking for them every time I’m there! Also, while I’m on the topic, what is with Homesense having a bunch of Easter stuff out already but nothing for Valentine’s Day?? Seriously disappointing. 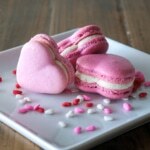 Anyhow, I’m not sure why I’m so into Valentine’s Day recipes this year. It’s not one of my favourite holidays, so I’m usually not very inspired when it comes to recipes for it. This year though, clearly the cute candy and sprinkles are driving the posts. 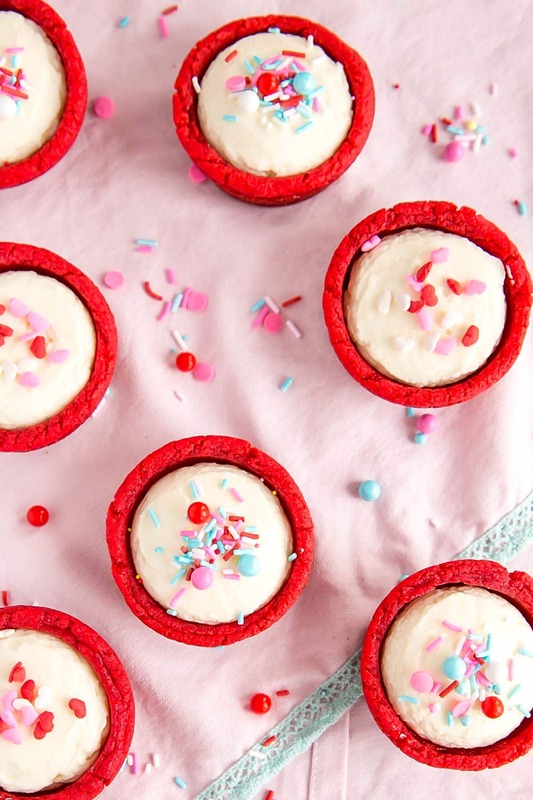 These Red Velvet Cookie Cups are technically only Valentine’s themed if you put heart sprinkles on them. You could totally use them to celebrate Canada Day or the 4th of July too! Or, you know, any random Monday where you need a pick-me-up. 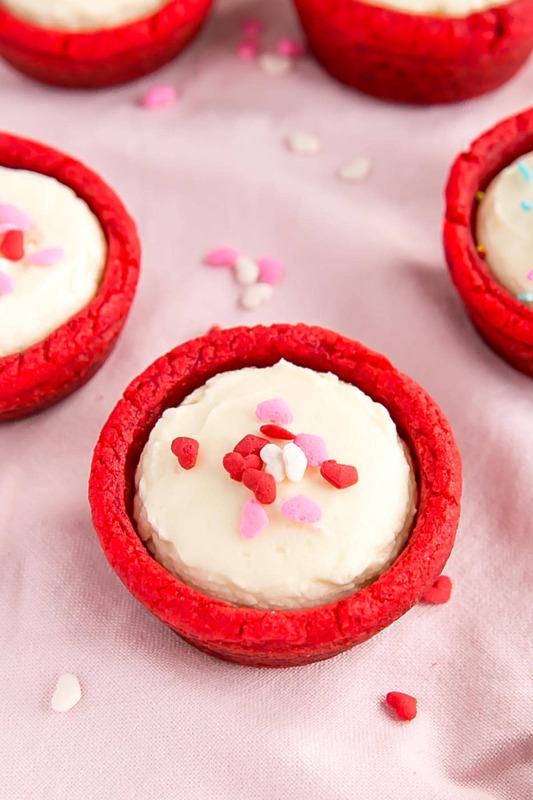 Making cookie cups is actually very easy. I’ve included some commonly asked questions below. 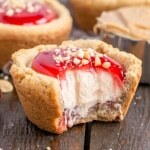 How do you make cookie cups? Spoon your cookie dough into a regular sized muffin tin. I use a large cookie scoop (about 3 Tbsp) to do this. Then all you need is some sort of device to press down into the cookies once they’re baked to make the cups — a shot glass or spice jar or even a measuring spoon will do the trick. You want to make sure that the cookies are mostly set in the middle before attempting to press down. If they’re still too raw, that’s okay, just pop them back in the oven for a minute or two to firm up. 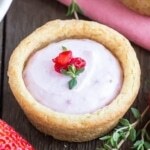 Can I make cookie cups in a mini muffin pan? I’ve never done so myself, but it will totally work. Many of my readers have made my cookie cup recipes as a mini version. You’ll want to use about 2 tsp or cookie dough per cup (instead of 3 Tbsp) and cook them for a shorter time — start checking at about 8mins or so. Can I make cookie cups in advance? Yes! 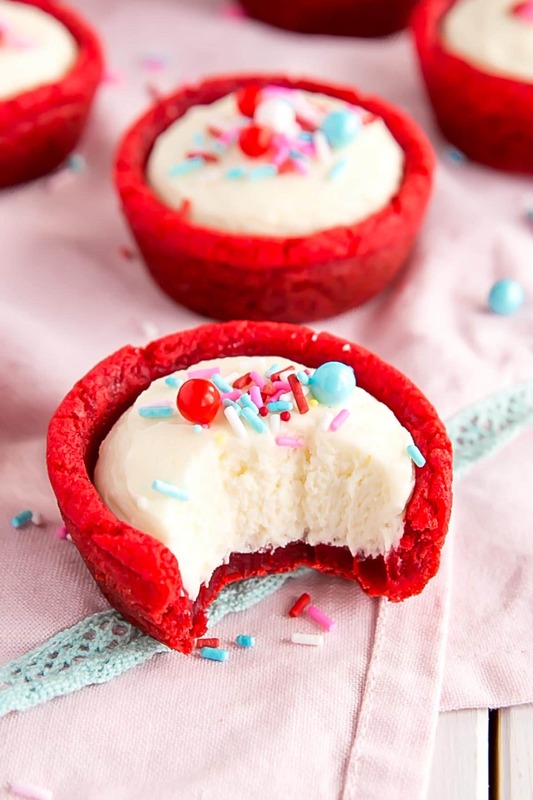 Most cookie cups can be made in advance and frozen for up to 4 weeks (possibly longer). 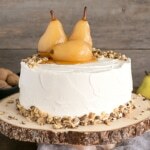 Thaw in the fridge overnight and decorate on the day you plan to serve them. I would not freeze them with the sprinkles on, as they might bleed. It’s important to note that the cookies will soften over time the longer they sit with the filling. I don’t mind this, as I personally like a chewy cookie, but it’s something you might want to keep in mind! You can serve them straight out of the fridge or at room temperature. I prefer them cold. If you don’t like cinnamon, you can just leave it out. 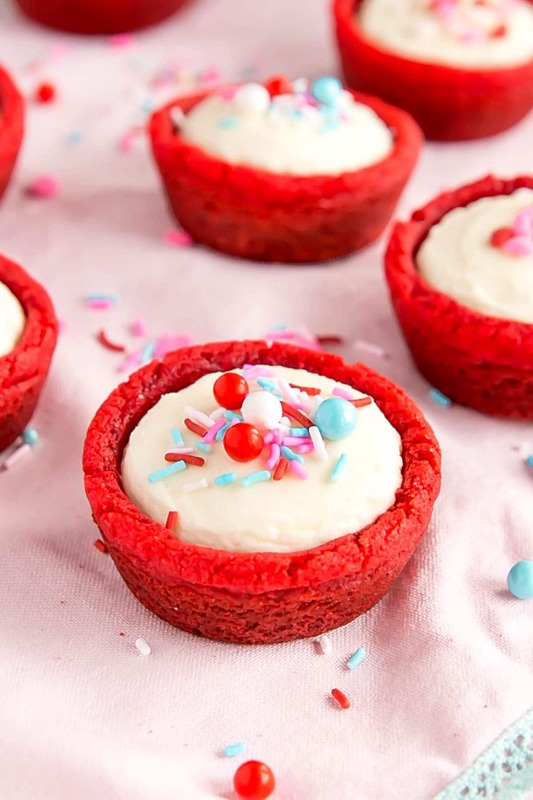 You can use any other color gel to color these cookie cups if you prefer. When whipping your cream, it’s best to use a cold mixing bowl with a cold whisk. This will help ensure maximum fluffiness. If the cookie cups seem very underdone when you press down to make them, just pop them back in the oven for a minute or two. They need to be soft, but not gooey. Preheat oven to 350°F. Spray a regular sized cupcake tin with cooking spray. Whisk together flour, baking soda, cinnamon, and salt, set aside. Beat butter and sugar on med-high until pale and fluffy (approx. 2-3mins). Reduce speed and add egg and vanilla. Beat until combined. Add in red color gel and beat until combined. Using a large cookie scoop (3 Tbsp), scoop dough into muffin tins, do not flatten. Bake for 12-14 mins or until mostly set. Remove from oven and immediately use a small jar or container to press firmly down in the center to create a well. * Cool in pans for 10 mins, then twist out and place on wire rack to cool completely. Fold cream cheese mixture into whipped cream. Pipe into cooled cookie cups and top with sprinkles. Refrigerate until set (approx. 2 hours). And thank you! You are so sweet! I actually don’t like cheesecake (gasp) which is why you don’t see many recipes for it on my site. I am so happy to hear you find my posts and recipes helpful!! Could I just sub in cocoa powder for some of the flour if I wanted to give these a bit more of a red velvet flavor? Or would I need to change some other parts of the ingredient list too? Hi Joanna! It depends on how much you want to sub in. I wouldn’t do more than a couple Tbsp. How much is 4oz cream cheese in cup measurement ? I enjoyed this recipe. 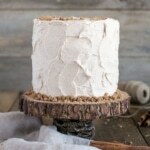 They were perfect for weekend baking as we are still getting snow in the Midwest, to this day! I had regular sprinkles and they looked just as festive as the images in the pictures above. So glad you liked these Wafa! Haha- yes, you can definitely find them at HomeSense! Sprinkles don’t really go bad though unless they get damp. 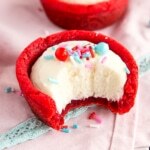 These are so vibrant and fun for Valentine’s Day. Thank you for the inspiration! Olivia todo lo que haces me parece estupendo y delicioso. Ya he hecho varias recetas y el resultado ha sido súper. Mis clientes quedan encantados. Por favor sería posible que la mantequilla la dieras en gramos? Es muy difícil calcularla en tazas. Con los demás ingredientes es un poco más fácil. Pero los ingredientes pesados son más confiables pues los utensilios para medir pueden variar y la forma de medirlos también. I have to chuckle when reading this post. You sound JUST LIKE ME!!!!! At least I’m not the only one!!! I’ll get something in my head and can’t let it go. I’ll spend WAY too much on a jar of sprinkles, or something else that I need, and use it one time!!! I think I need an intervention. I love Sweetapolita way too much!!! Oh well. Life is short. Let’s enjoy our sprinkles!!! BTW…love your site. 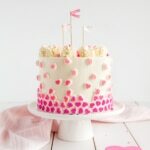 Your cakes are the bomb.com.